Modern golf is a sport indigenous to Scotland, although the Netherlands also lays claim to an ancestor game. The word golf may have derived from either the Dutch kolf, meaning "stick" or "club", or from the Scots goulf, "to strike or cut off." Whatever the origin of the word, the modern game did indeed originate and develop in Scotland. Legend says that bored shepherds around St. Andrew's developed a game to pass the time that involved hitting round stones into rabbit holes with their crooks. The archives of the Royal Burgess Golfing Society contain documents showing that the first real game of modern golf was played on Bruntsfield Links in Edinburgh in 1456. (Links is the oldest style of golf course, which consists of a stretch of land near the coast with an undulating terrain.) The following year, King James II banned golf because it interfered with his subjects' archery practice. James III reinstated the ban in 1471, and James IV did the same in 1491. He lifted it, however, in 1502, himself having taken a liking to the game; records show that he paid a merchant in Perth 14 shillings for a set of golf clubs, which he used to play on a links in that city. Even Mary, Queen of Scots, fancied the sport: in 1567 she became the first female golfer by playing on the links at Musselburgh, which in 1811 served as the site of the first women's championship. Archbishop Hamilton of St. Andrew's obtained a Royal charter for the first permanent golf course in 1552, which reserved for the people of St. Andrew's the right to use the links land "for golff, football, shuteing and all games." The world had to wait another two hundred years, however, for more formal innovations to come to golf. 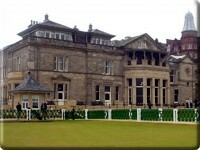 The Royal Burgess Golfing Society, the first golfing club, formed in Edinburgh in 1735. In 1744, it codified the first formal written rules of golf for the Annual Challenge for the Silver Club in Edinburgh. 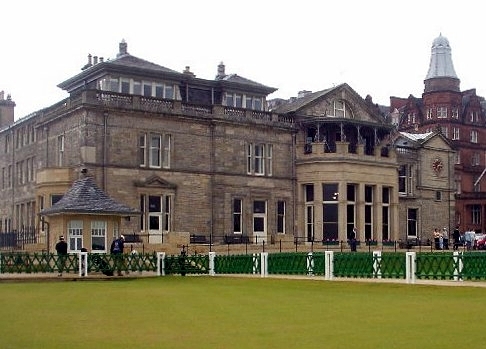 The Royal and Ancient Golf Club of St. Andrew's formed in 1754 and celebrated by hosting the country's first national tournament, which was entered by teams representing cities all over Scotland. Ten years later (1764), St. Andrew's also implemented the first 18-hole golf course. Previously, the course consisted of 22 holes. By 1858, 18 holes had become the standard. The game of golf was still in its infancy in North America in the late nineteenth century. Introduced by Scottish immigrants, it caught on as a leisure activity among the wealthy. The wealthiest man in Windsor at that time was Hiram Walker, an American immigrant who had made his fortune on whisky. In the late 1880s he established the Walkerville Country Club, and although golf was by no means popular in the area at that time, he laid the groundwork for a rudimentary 9-hole golf course on the site where Walkerville Collegiate High School now stands. Designed without the proper engineering, however, the Walkerville course drained very poorly and could not be played for several days after a rainfall. The course was also marked by an absence of ground contours, sand bunkers, and other obstacles, making golf in Walkerville a rather bland activity. Disgruntled Scottish Windsorite George Mair decided, along with other local golfers, that the area was in desperate need of a more suitable golf course. By 1902, Mair had successfully solicited enough community support to warrant the establishment of a new club. Mair, appropriately, was elected the first president of the Oak Ridge Golf Club. The course was set out on 130 acres of land in the northwest corner of Ojibway donated to the club by the Detroit iron and lumber magnate William Clyman Yawkey. Mrs. George Mair secured membership subscriptions to the new club and raised enough money to erect a small clubhouse. Over the course of the decade, the Oak Ridge Golf Club enjoyed great success and an ever-expanding membership. This growth, however, meant that the golf course and club house were soon incapable of accommodating increased demands. So in 1909, the Oak Ridge directors purchased a 53-acre property at the intersection of Prince Road and the Essex Terminal Railway line in Sandwich. The lease on the Yawkey farm expired as construction began on Prince Farm, so the Oak Ridge golfers reverted to Walkerville for the 1910 season. Their ripe enthusiasm for the new course infected the Walkerville golfers, and the two clubs amalgamated to form the Essex County Golf & Country Club. With an impressive capital of forty thousand dollars, the new club was incorporated under an Ontario Provincial Charter in October of that year. Its members happily abandoned the Walkerville links in the spring of 1912, when the 9-hole course on Prince Farm opened for play. By 1915, the course had been expanded to the standard 18 holes. Yet, many golfers were still dissatisfied with the overall quality of the course, which had too many short holes and not enough sand bunkers and contour in the putting greens. During the club's annual meeting in January 1916, Gordon McGregor, the director, suggested buying up more land to create "the best eighteen-hole golf course west of Toronto." 1 The fact that the club lacked the financial resources to purchase land or pay an expert to renovate the course did not discourage the self-made millionaire. McGregor bought an additional seven acres of land adjacent to the country club from the Woollot family for $5,000, and agreed to sell the property to the club at cost when it had raised the appropriate funds. Despite the expansion, a general feeling of angst pervaded the Essex members, who feared that Prince Farm would soon be enveloped by urban development as the City of Windsor began to boom. By 1919, there was serious talk of moving to a more rural location. The directors purchased fourteen individual farms consisting of 125 acres on Matchette Road in LaSalle for a little over $100,000. America's first superstar of golf, Donald J. Ross, a native of Dornoch, Scotland, was hired to design a championship-worthy course. He had already completed fifteen notable courses in the Detroit area by the time the Essex directors contracted him, and he had been preceded by his extraordinary reputation as a golfer, teacher, and greens-keeper. Ross appointed longtime Essex Club greenskeeper (and Scotland native) John Gray as supervisor for the construction of the course, which began in May 1928. Gray wielded an enormous amount of influence over the design, especially since Ross was, at the time, engaged in projects all over North America, and only visited the LaSalle site once. After fifteen months of construction and grow-in on Matchette Road, the 6,683-yard, 72- par course opened in July 1929. In the 1950s, the fourth hole was scaled down from a par 5 to a par 4 on the advice of the Royal Canadian Golf Association, resulting in a challenging 71-par course. Gordon McGregor's dream had been fulfilled: over the course of the twentieth century, the Essex County Golf Course earned a reputation as one of North America's finest. It has hosted numerous championship tournaments, including the 1976 Men's Canadian Open, the 1998 LPGA du Maurier, and the 2002 AT&T Canada Senior Open. Today, the Essex County Golf & Country Club is one of LaSalle's largest employers and has nearly 1,100 members. One might suspect that George Mair would be well pleased.